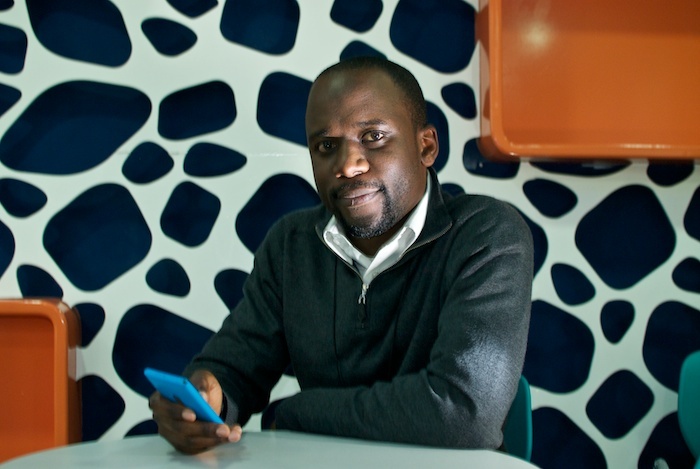 Moses Sitati, development economist, in the café area at Nokia Research Center, Nairobi. 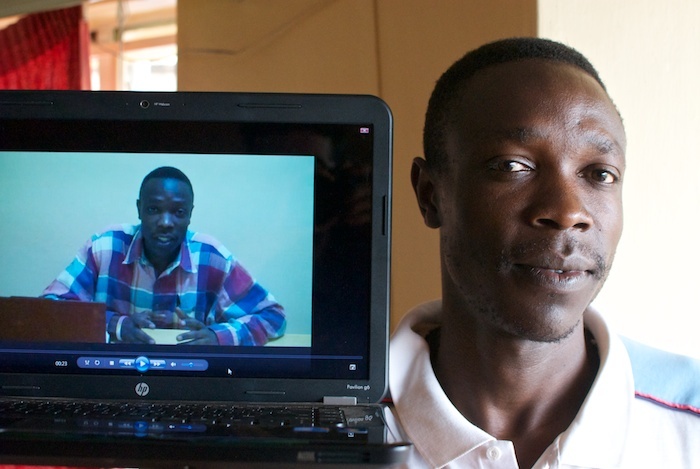 The center researches, prototypes and tests products for the sub-Saharan market. 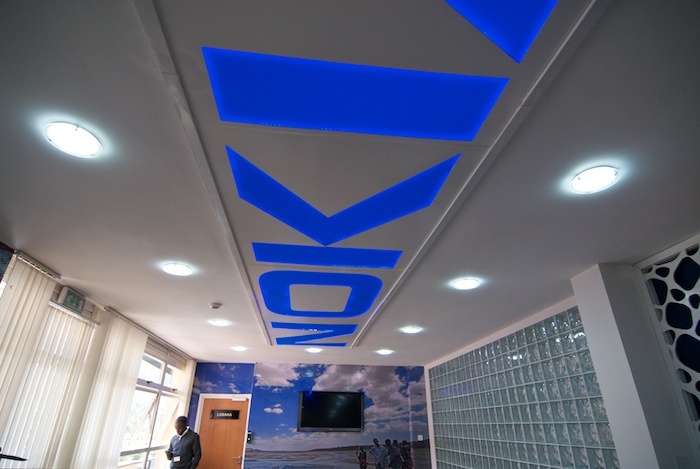 Moses Sitati, checking email on a Nokia N9 phone, outside meeting room “Lusaka” at the Nokia Research Centre, Nairobi. 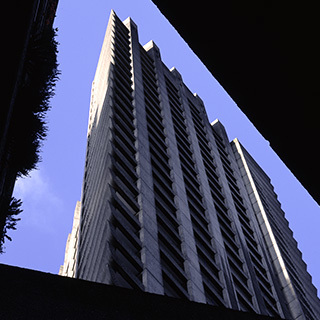 The centre aims to meet ‘African-specific challenges’ including low income, access to power, and local languages and scripts. 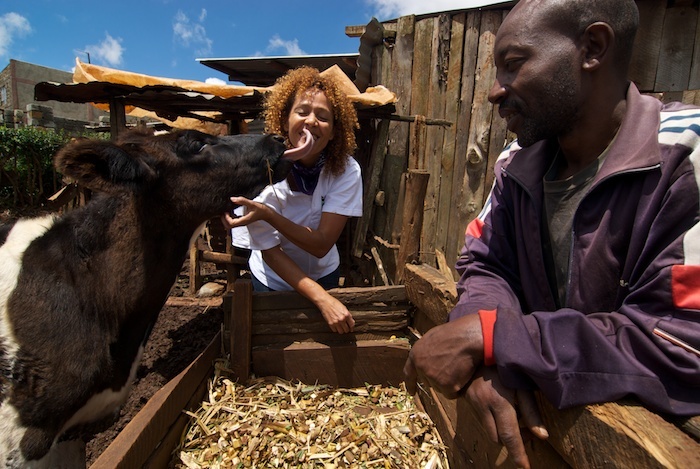 Su Kahumbu, founder of iCow, is licked by a Jersey-Friesian cross as John Njure, a small-scale dairy farmer from Kamirithu looks on. iCow is a text-message based service that automates basic record-keeping for dairy farmers. Kenya has 1.6 million such farmers; many of them are small scale, and use ‘rudimentary’ methods. Registering a cow via text message; the service allows a farmer to keep track of the reproductive cycle and milk production of each member of their herd. Subscribers receive immunisation, diet and calf-care information on their phones. The ‘Soko’ (Market) feature lets advertise animals for sale. 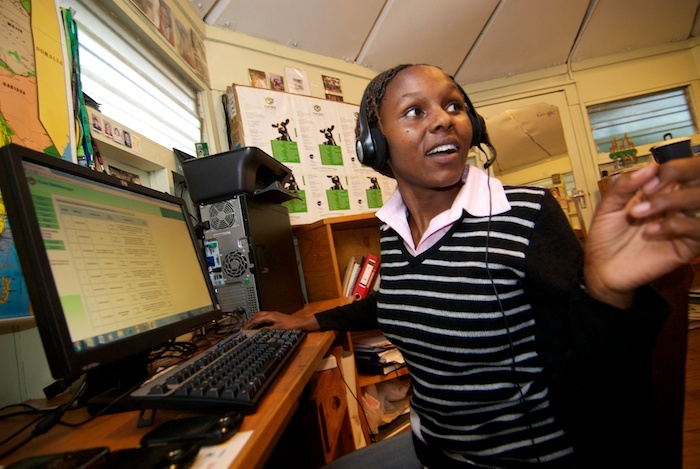 Teresia Macharia at the iCow office, providing phone-support. 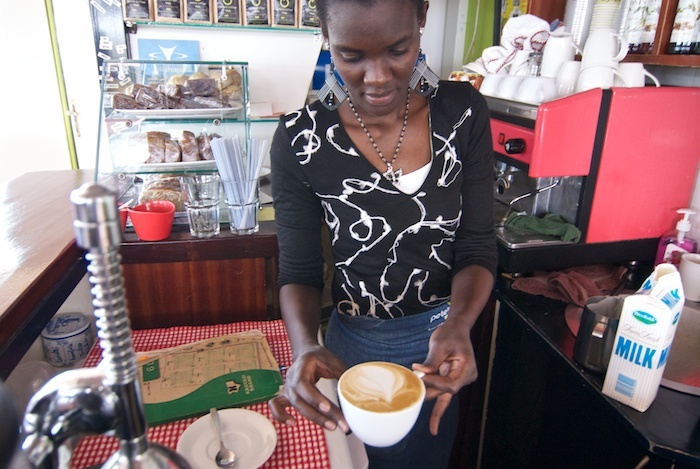 The service, launched in 2011, has 1400 dairy-farmer customers across 32 of of Kenya’s 47 counties. The application won the Apps4Africa competition. 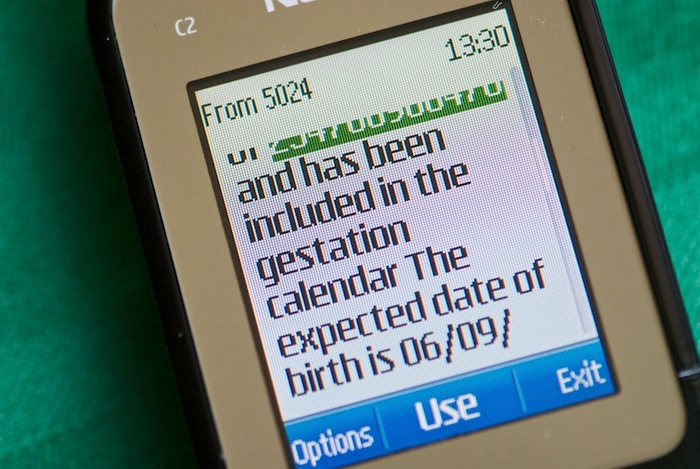 The system prompts farmers on vital days of cows gestation period by text message. Erik Hersman blogs as whiteafrican.com. 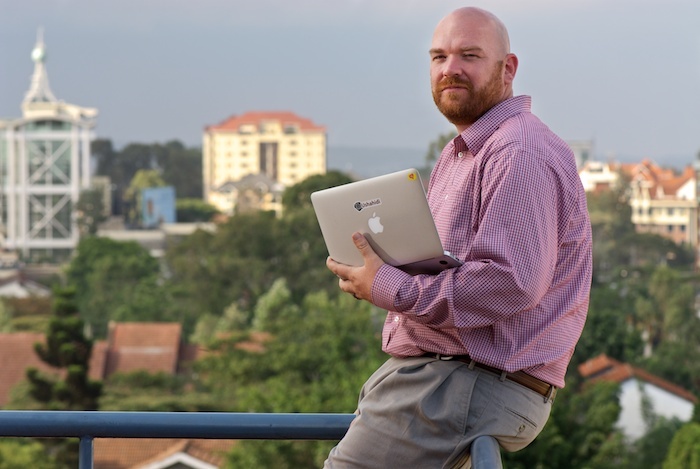 Founder of the iHub, on the balcony, overlooking west Nairobi. 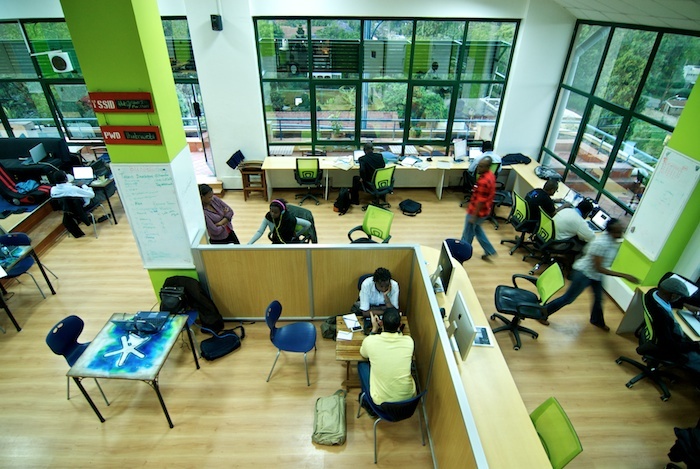 iHub is an ‘Innovation Hub’ for the technology community in Nairobi. 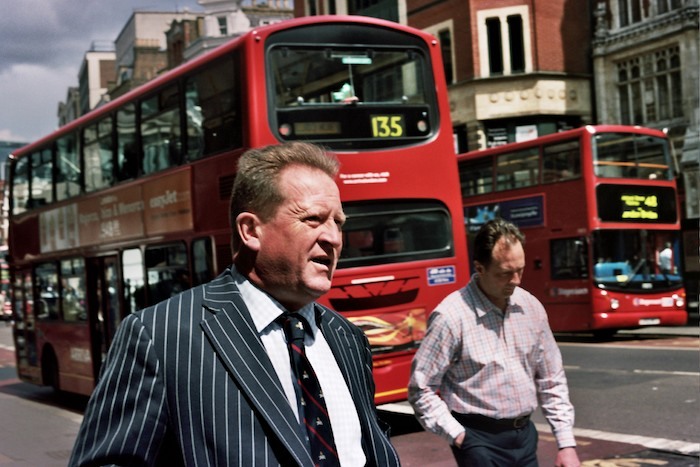 Members are typically programmers, designers and investors. Hot-desking at the iHub. ‘Red-card’ members have a semi-permanent desk and locker. Other members drop in. All share power, WiFi and human networking. 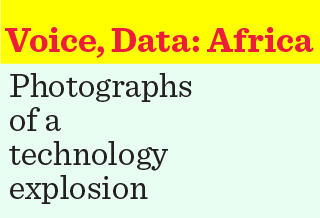 The space is also a base for Ushahidi (“testimony” in Kiswahili), technology initially developed to map reports of violence in Kenya after the post-election fallout at the beginning of 2008. 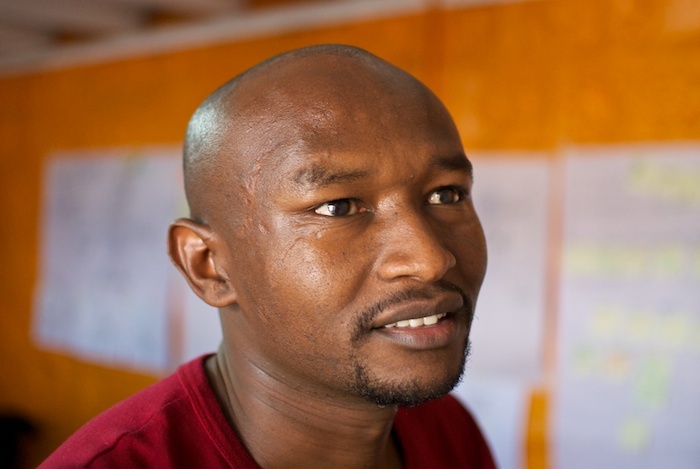 Tosh Juma, “iTosh”, the manager and community-lead, on the balcony at iHub: “My role is talking to people and making connections; we needed a nexus for people. 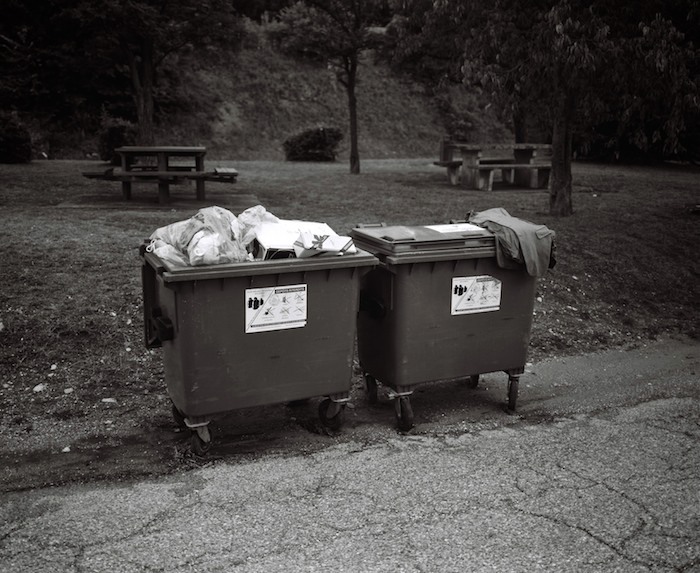 In March 2010 this place was just a rough floor, no furniture, but we had internet, and we’ve shaped it”. 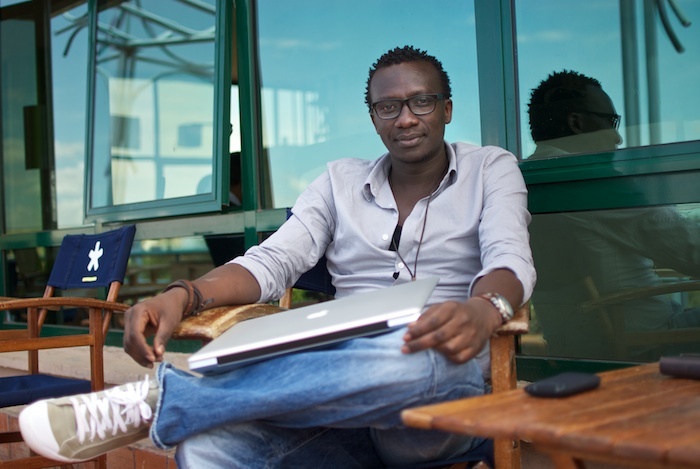 Before iHub, Tosh was a designer and trainer at Nairobits. 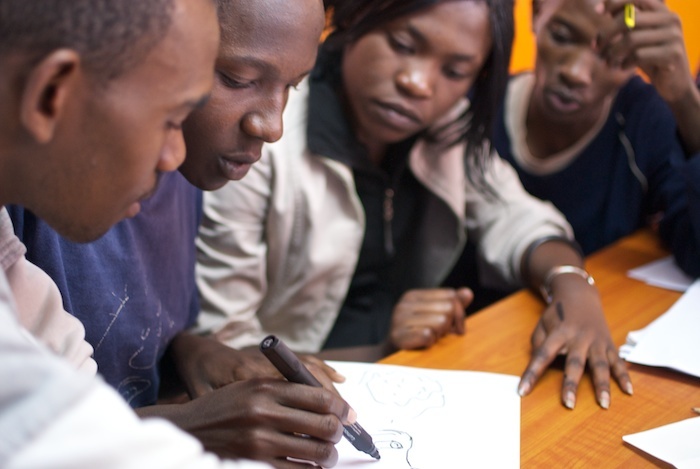 Students sketching at a design workshop, NairoBits. 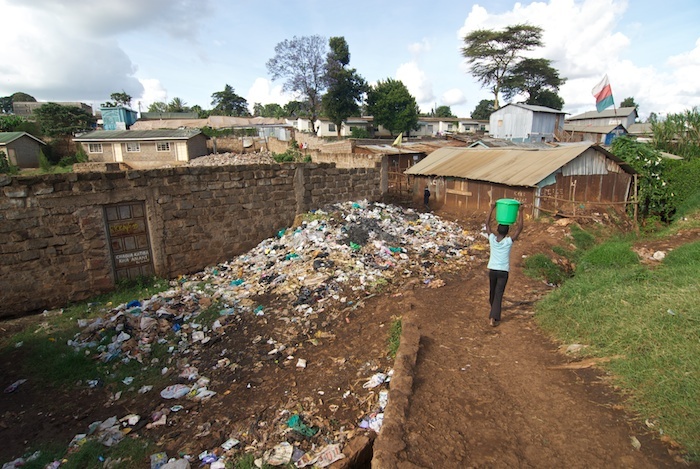 Refuse heap, Kibera, the largest slum in Nairobi, and the second largest urban slum in Africa. 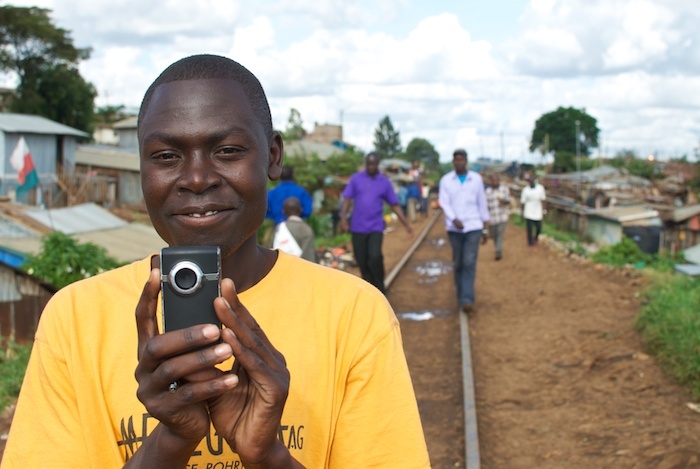 Joshua Owino, of Kibera News Network, a citizen journalist reports directly on and for the slum settlement. 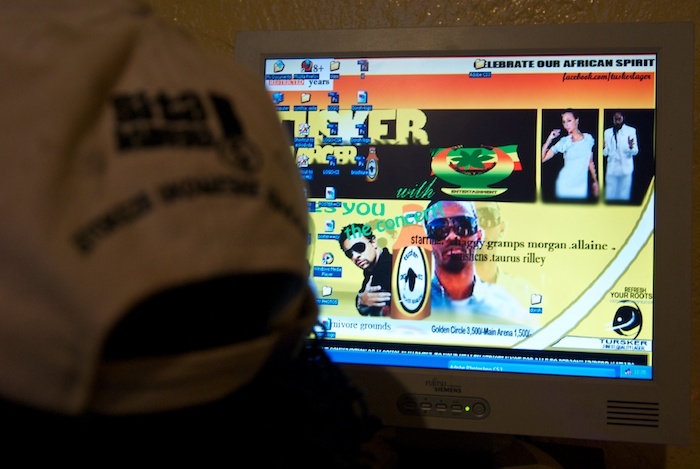 Joshua presents up to 8 short news pieces a month; posted online and shown at Video Houses – small TV-cinemas which which show films and football matches within Kibera.